Babies and toddlers enjoy Halloween as much as the next kid, but as a parent, you do need to take special precautions when it comes to Halloween treats. Most Halloween treats are packed with sugar, artificial colors and flavors and other icky stuff your little one doesn't need. Plus, many Halloween treats pose a very real choking hazard for young children. Your baby or toddler should not have hard candies, gooey chewy taffy-type candy, caramel apples, popcorn, gum, small candies (jelly beans, etc), gummy candy, pumpkin seeds or chocolates or cookies filled with nuts, peanut butter or honey. Also keep in mind that candy wrappers can be a choking hazard as well. Keep your eyes on your older child's loot - it should be kept out of reach of younger kids. Now that we've gotten all Grinchy on you and taken away all the "official" fun treats, what to do? Easy - your little one can still have yummy Halloween treats, just make sure they're safe. Keep reading to see some delicious and safe Halloween treats for babies and toddlers below. 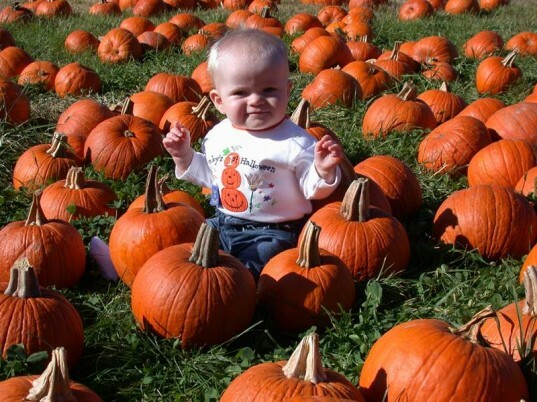 If your baby is too young for any other Halloween treat, at least get in the spirit with some fresh pumpkin purees and other pumpkin baby food. Pumpkin, while associated largely with Halloween and Thanksgiving, is great anytime of the year. Whether canned, frozen or fresh, pumpkin packs a powerful nutritional punch for your growing baby. Pumpkin is loaded with beta-carotene, an important antioxidant plus plenty of vitamin A, potassium, vitamin C, calcium and much more. Pumpkin broccoli puree: Steam 1/2 cup of fresh organic broccoli until soft. Blend the broccoli and 1/4 cup canned or fresh organic pumpkin puree in your blender or food processor until smooth. If it’s too thick, thin it out with a bit of breast milk. Baked mashed pumpkin & spice: Cut an organic pumpkin into chunks. Place chunks face down (not shell down) in a baking dish filled with 1-2 inches of water. Bake for about one hour at 400 degrees. Once cooked soft, scoop out baked pumpkin with a spoon, mash it with a fork or puree it in the blender. Add a dash of cinnamon and nutmeg. Vegan Almond Cookies – cut with Halloween cookie cutters. Holiday pumpkin cookies (make these without the raisins or candy). Miniature organic pumpkin whoopie pies – for toddlers only, not babies. Pumpkin oatmeal cookies (minus the raisins and nuts). Beautiful Sweets makes organic cookies for all the holidays, packs them in eco-friendly packaging and ships them right to you. 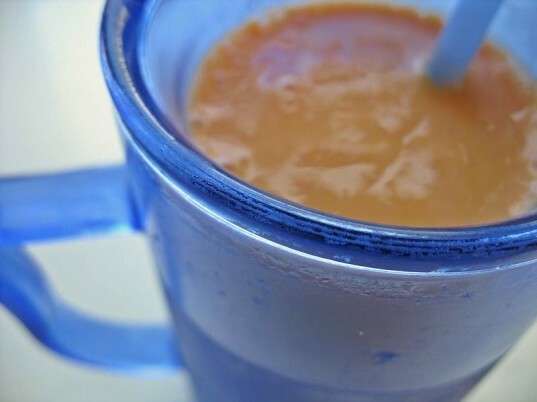 Blend everything, minus the ice to a nice smooth consistency. Add ice and blend until thick and creamy. This tastes great plain, but you can garnish with organic whipped cream and a dash of cinnamon if you like. This is a great alternative to ice cream for little ones. See more awesome smoothie recipes. Ice pops are good icy fun year-round, but at Halloween you can get super creative with ice pops made in festive fall flavors and colors. You can even use spooky ice pop molds. Below are some amazing ideas. 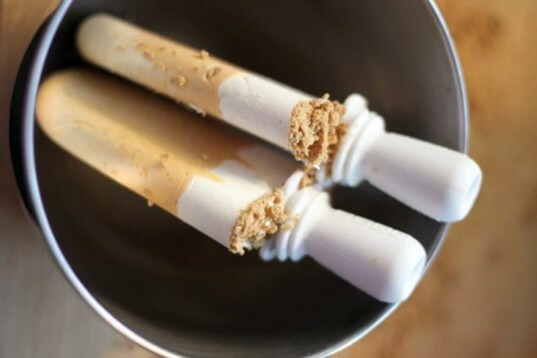 As seen above, creamy Pumpkin Pie Popsicles via the lovely food blog, Kitchen Corners. Vanilla tofu ice pops (add a dash of natural orange food coloring). Maple and squash pumpkin pie ice pops. Homemade veggie pops – which can be made with pumpkin. Sugar pumpkin ice pops (minus the pumpkin seeds). See Ice Pop Joy for more icy treat ideas, including an amazing Harvest pop. 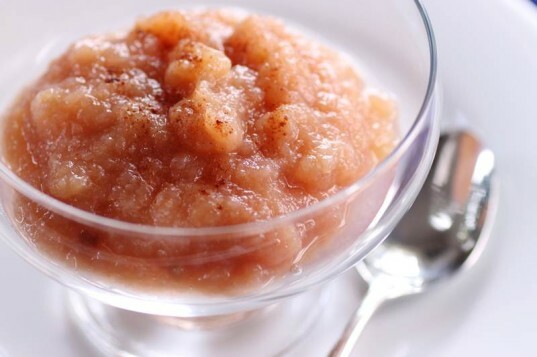 Easy homemade organic applesauce all on its own is a perfectly acceptable Halloween treat for young children, especially when you add a dash of cinnamon or nutmeg. However, if you really want to try a Halloween specific treat, why not serve up some festive and yummy pumpkin applesauce? 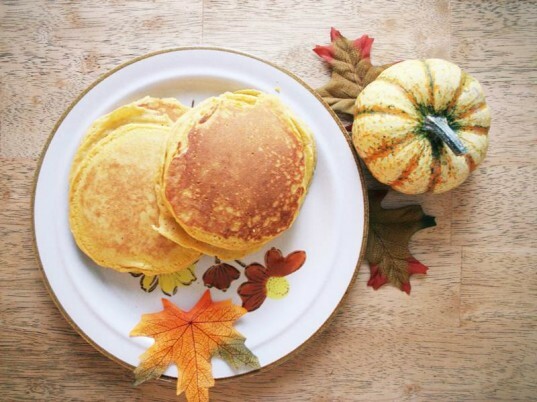 Most little ones love pancakes, but you can make them healthier and more tasty simply by adding a little pumpkin. Whip up some pumpkin pancake batter, then scoop tiny spoonfuls onto a hot griddle and then serve up these sweet little treats for breakfast, or anytime of the day. To add to the fun, skip the circles and use a cute pumpkin pancake mold that will really impress your kids. 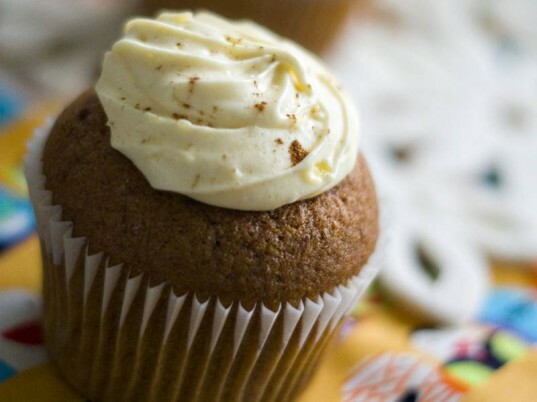 Pumpkin cupcakes are easy as pie, and while not sugar-free are healthier than most cakes due to the pumpkin, and can be eaten plain or with a simple dollop of whipped cream or frosting. In a medium sized bowl, whisk together 2 cups organic white flour (you can sub 1/4 cup wheat flour for 1/4 white), 1 teaspoon baking soda, 1 teaspoon baking powder, 1 teaspoon salt, 1 teaspoon each cinnamon and ginger, and 1/4 teaspoon each nutmeg and allspice. Note – if you don’t keep allspice around, add a dash of ground cloves. In a larger bowl, mix 1 cup organic brown sugar, 1 cup granulated organic sugar, 2 sticks (1 cup) of melted and cooled organic butter and 4 organic eggs. Add the dry ingredients to the wet and mix until smooth. Mix in 15 oz of organic pumpkin puree. Pour pumpkin batter into reusable silicone cupcake liners or a greased stainless steel muffin pan. For the youngest children use a mini muffin pan. Only fill about halfway. Bake in a 350 degrees oven until the tops spring back when touched (about 20 to 25 minutes). Transfer to a wire rack and allow them to cool completely if adding a topping. If not adding a topping, these are super yummy served warm. 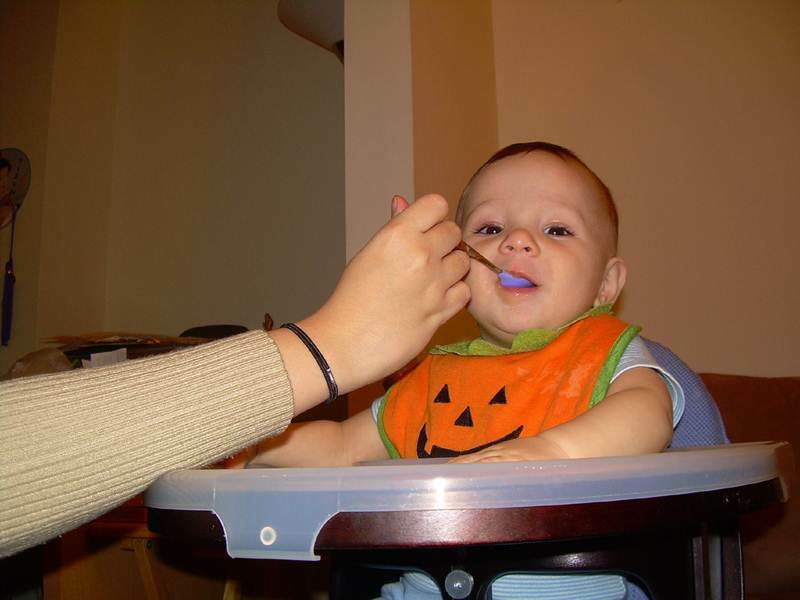 If your baby is too young for any other Halloween treat, at least get in the spirit with some fresh pumpkin purees and other pumpkin baby food. Pumpkin, while associated largely with Halloween and Thanksgiving, is great anytime of the year. Whether canned, frozen or fresh, pumpkin packs a powerful nutritional punch for your growing baby. Pumpkin is loaded with beta-carotene, an important antioxidant plus plenty of vitamin A, potassium, vitamin C, calcium and much more. Pumpkin broccoli puree: Steam 1/2 cup of fresh organic broccoli until soft. Blend the broccoli and 1/4 cup canned or fresh organic pumpkin puree in your blender or food processor until smooth. If it's too thick, thin it out with a bit of breast milk. Baked mashed pumpkin & spice: Cut an organic pumpkin into chunks. Place chunks face down (not shell down) in a baking dish filled with 1-2 inches of water. Bake for about one hour at 400 degrees. Once cooked soft, scoop out baked pumpkin with a spoon, mash it with a fork or puree it in the blender. Add a dash of cinnamon and nutmeg. 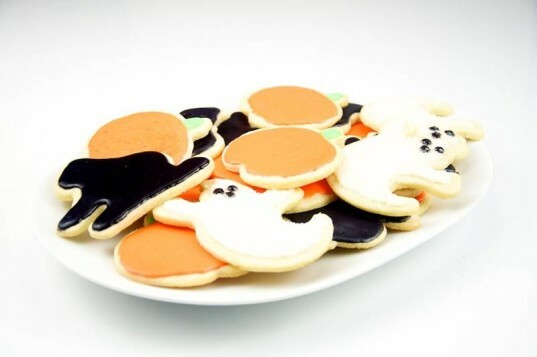 Halloween cookies are one of the easiest treats for little ones. Just make sure you choose a basic organic cookie with either no frosting or just a little icing made with non-toxic food coloring. Skip candy cookie toppers and other add-ins, such as nuts. Below are some nice Halloween cookie ideas for younger kids: Vegan Almond Cookies - cut with Halloween cookie cutters. Holiday pumpkin cookies (make these without the raisins or candy). Miniature organic pumpkin whoopie pies - for toddlers only, not babies. Pumpkin oatmeal cookies (minus the raisins and nuts). Beautiful Sweets makes organic cookies for all the holidays, packs them in eco-friendly packaging and ships them right to you. Ice pops are good icy fun year-round, but at Halloween you can get super creative with ice pops made in festive fall flavors and colors. You can even use spooky ice pop molds. Below are some amazing ideas. As seen above, creamy Pumpkin Pie Popsicles via the lovely food blog, Kitchen Corners. Vanilla tofu ice pops (add a dash of natural orange food coloring). Maple and squash pumpkin pie ice pops. Homemade veggie pops - which can be made with pumpkin. Sugar pumpkin ice pops (minus the pumpkin seeds). See Ice Pop Joy for more icy treat ideas, including an amazing Harvest pop. In a medium sized bowl, whisk together 2 cups organic white flour (you can sub 1/4 cup wheat flour for 1/4 white), 1 teaspoon baking soda, 1 teaspoon baking powder, 1 teaspoon salt, 1 teaspoon each cinnamon and ginger, and 1/4 teaspoon each nutmeg and allspice. Note - if you don't keep allspice around, add a dash of ground cloves. In a larger bowl, mix 1 cup organic brown sugar, 1 cup granulated organic sugar, 2 sticks (1 cup) of melted and cooled organic butter and 4 organic eggs. Add the dry ingredients to the wet and mix until smooth. Mix in 15 oz of organic pumpkin puree.